Lemme ask ya a quick question…. Is there anything better than Chicken and Biscuits? How bout Cheesy Chicken and Biscuits? 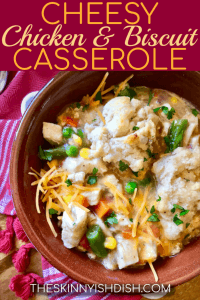 Okay, Easy Cheesy Chicken and Biscuit Casserole chock-full of veggies and gravy? I just can’t think of anything right now. As long as you’ve got some precooked chicken ready to go. 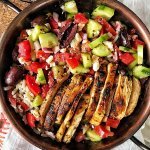 This recipe can be prepped in no time and on the table within 30 minutes for an almost homemade, easy, cheesy, soul warming, dinner. I’m pullin’ out all the short cuts in this recipe because y’know what? Sometimes we just need’m. 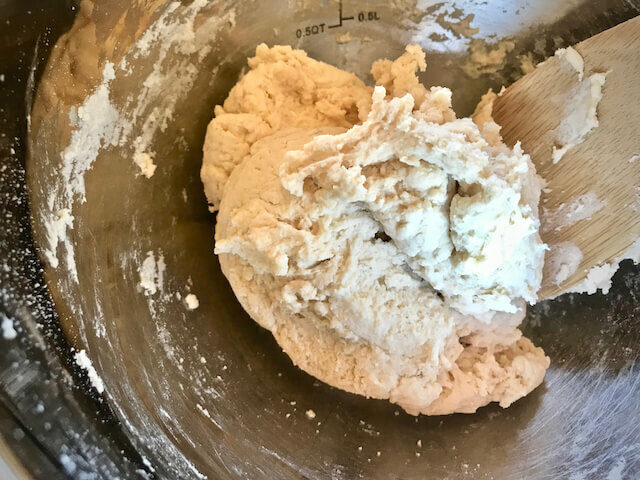 The biscuits aren’t from scratch, but they sure are delicious and the gravy might be from a jar on the store shelf, but every once and awhile that’s the way it goes in our house. It’s healthier than fried chicken take out and that’s a fact. 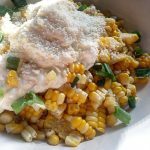 This has been a family favorite for years and I know it’ll quickly become a quick n’ easy weeknight delicious dinner staple for you too! We sorta kinda had a rough one this past week. I won’t bore you with all the details, but we were all sick, and none of us got very much sleep. 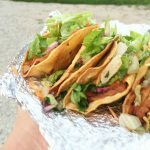 I pretty much took the week off from the kitchen, because my energy was zapped, so it was a week of quick and easy meals, most of which came out of the freezer. But on Saturday, I got right back in the kitchen. Since I hadn’t really gone grocery shopping, there wasn’t much to chose from. I had chicken that needed to be used up, so all I really knew was that chicken would be the base of the meal. I asked Eric what he would like, and he basically said, “Whatever you make will be good.” Thanks for the help, babe. 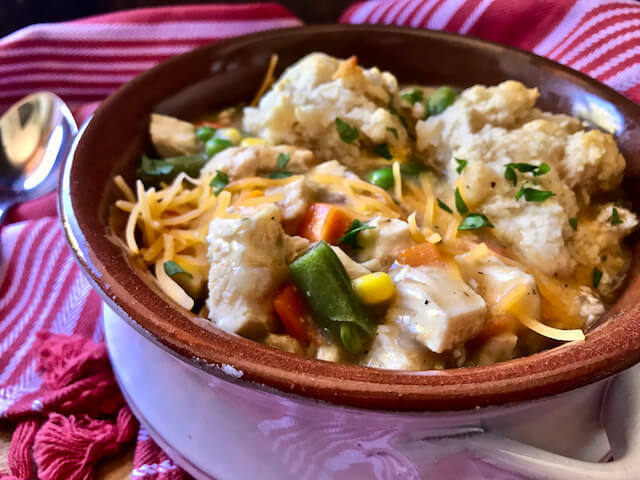 I decided comfort food was in order after the week we had… Easy Cheesy Chicken and Biscuits needed to be made! If you’re feelin’ extra hungry I love pairing this meal with a big ol’ spoonful of my Cauli-Tater Mash. It takes a bit of time to cut the potatoes and cauliflower up, but other than that this recipe is easy peasy too. 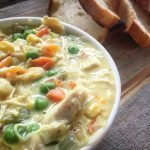 This recipe came together from a memory I had of how my aunt used to make her Chicken Pot Pie for family gatherings. I lightened it up quite a bit, and of course, I added cheese. I’m sure she also made a delicious homemade gravy. 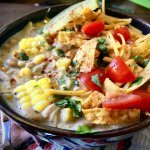 I thought about making up a homemade gravy, and perhaps I still will someday and add it in the future, but I wanted to make this here recipe super yummy, quick, and easy enough for any night of the week, but especially those busy ones! I hope y’all love it up. Fiiiiiirst, Preheat yer oven to 375 degrees. 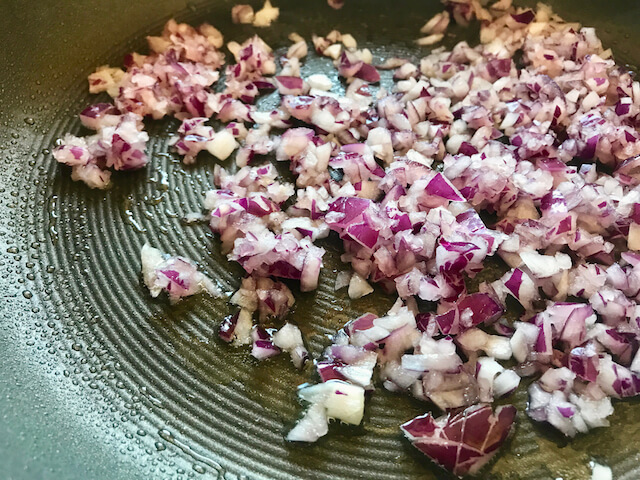 Now, you’re gonna add one chopped red onion into a large skillet that’s been lightly sprayed with some cooking spray. Sauté for a few minutes over medium-low heat until onions are softened up a bit. Add in four cups of frozen veggies. See, how easy is this? Stir together and heat them for a couple of minutes. Get some chopped and cooked chicken, 1/2 tsp of thyme, and salt and pepper to taste! 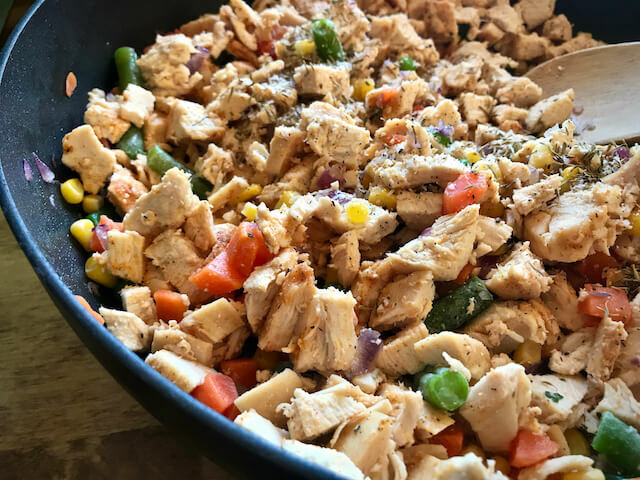 You can use this shredded chicken recipe, rotisserie chicken, leftover chicken breasts, or Thanksgiving is coming… leftover turkey breast definitely works! 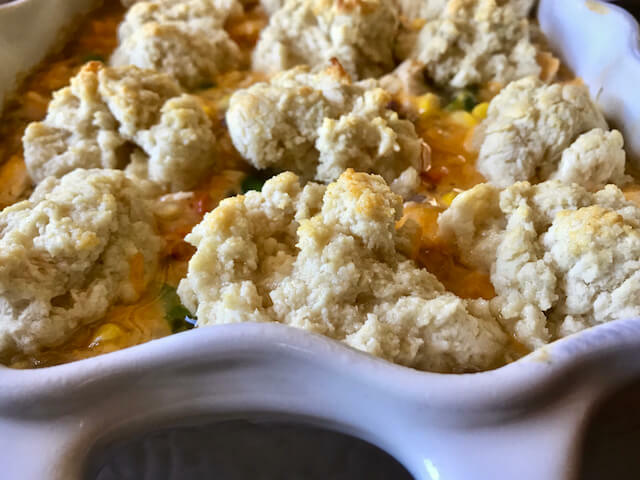 Make it a Easy Cheesy Turkey and Biscuit Bake! Here, I’m using some quickly roasted chicken breast that I diced up. I am going to get the recipe up for some perfectly roasted chicken breasts soon and I’ll link it then. Now, let’s get down to business with the yummy biscuit part. In a large bowl, add 2 cups of the mix and a 1/2 tsp of garlic salt. Stir together. I’m a super big fan of homemade biscuits, but these really do the trick. 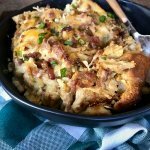 I keep a box of this Bisquick on hand for a few different things so it’s a good go to when I want to make this casserole. 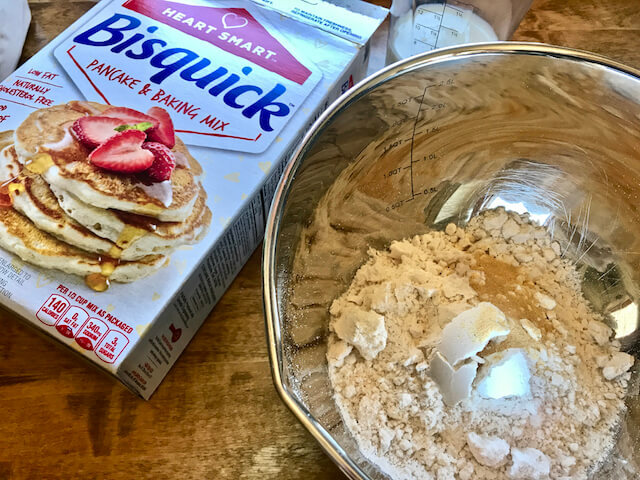 I use the Heart Smart Bisquick Baking Mix which is lower in calories and fat, but using regular Bisquick is fine too. You can also use the recipe for my Garlic Parmesan Drop Biscuits on top of this. It works wonderfully and deliciously! Adjust the points and/or calories if you care about that sort of thing accordingly if switching things up. Add 3/4 cup of milk. Stir it together really well. 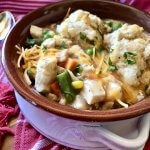 In a 3 quart casserole dish, add chicken and vegetable mixture and pour gravy all over. Stir together and then top with 3/4 cup of shredded sharp cheddar. 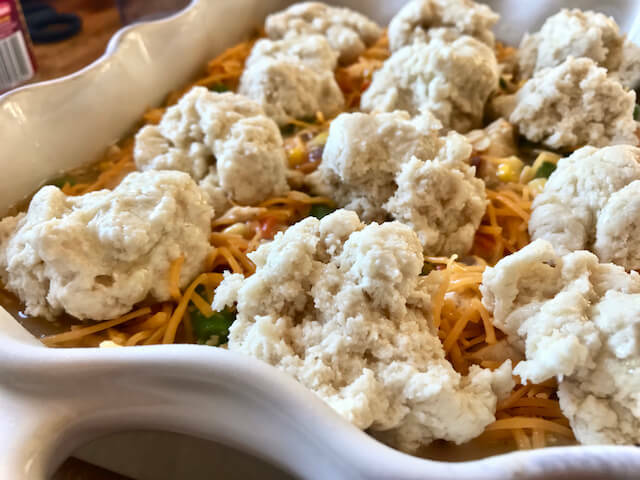 On top of the cheese scoop and drop biscuits onto the top of the casserole with a metal spoon. There should be 12 drop biscuits total. Place into the preheated oven, uncovered, and bake for about 23 minutes or until the tops of biscuits are golden. I really don’t think it needs much. It’s simple. It’s delicious. And the family absolutely loves it! 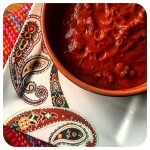 In the colder months, I truly make this once every couple of weeks. You know what? It hits the spot every time! 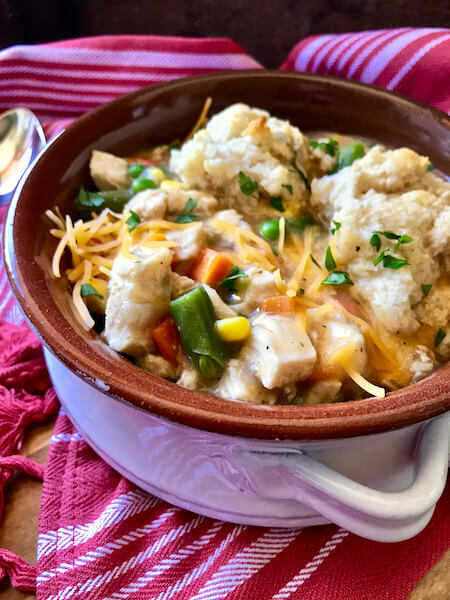 If you’re not in the mood to make up Cauli-Tater Mash… a good ol’ fashioned salad on the side is perfect too to make your meal complete. 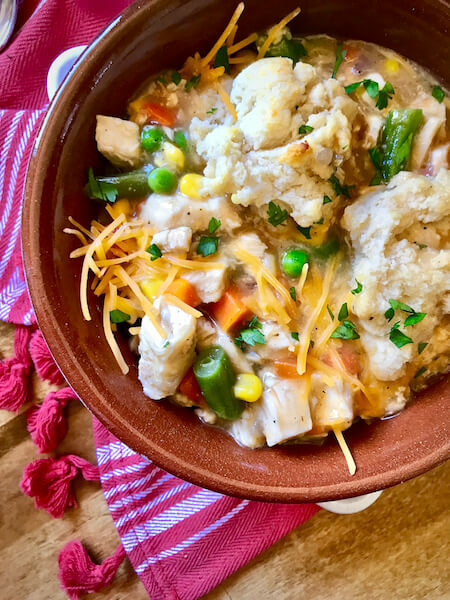 Chicken and veggies mixed up in a delicious gravy and topped off with sharp cheddar and semi-homemade drop biscuits. Preheat oven to 375 degress. Lightly spray 3 quart casserole dish with cooking spray. In a large skillet, lightly spray with cooking spray and sauté onions for a few minutes until softened. 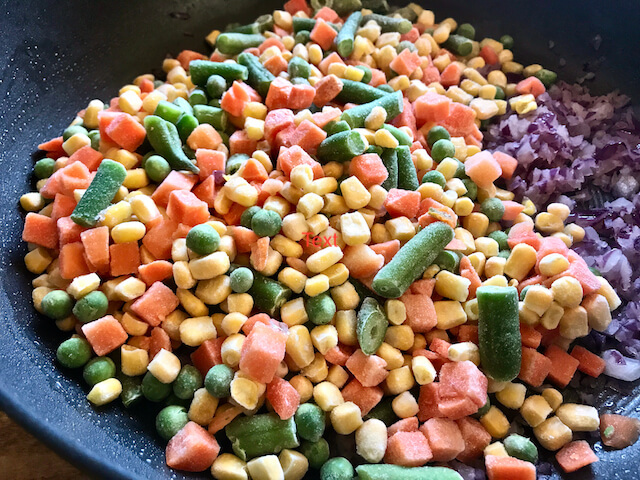 Add frozen veggies to pan and stir together until the veggies are lightly warmed up. Add chicken, thyme, and then salt & pepper to taste. 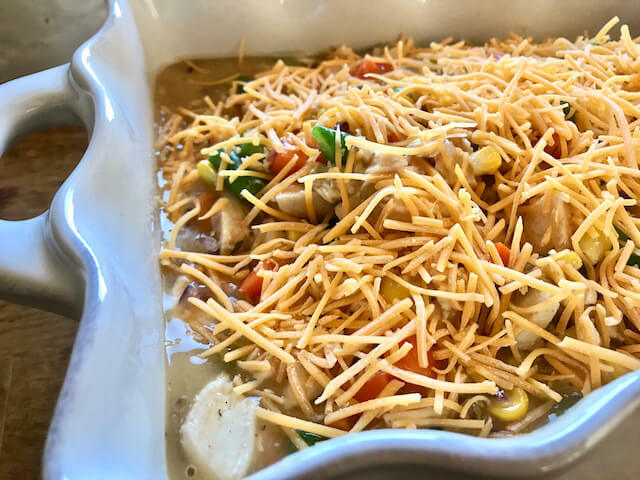 Add the chicken and vegetable mixture to the casserole dish, pour chicken gravy into the dish and stir until combined well. Evenly sprinkle with the shredded cheddar on top. With a metal spoon drop biscuit dough on top of the cheddar. You will have enough to make 12 biscuits. Bake for 20-23 minutes or until biscuits are golden on top. Let sit for a few minutes before cutting into. Enjoy! 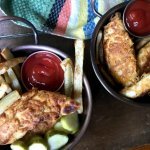 Made this tonight and it was a big hit with my picky husband and 6 year old son. Yay! 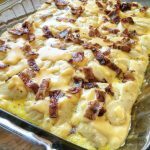 Can you use canned pillsbury biscuits for this recipe? Yep! The oven time may vary a bit, just keep an eye on’m in the oven. Yummy dinner! Hubby loved it – thank you!!! Yum. How many Smart Points vs Freestyle Points? Thanks! 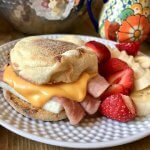 I’m sorry, I don’t have the original smart points info for this recipe, you can use the nutritional info and calculate it in the app you use. I hope you love it! Hi there! I don’t think the biscuits would hold up too well, but I haven’t tried it personally so I can’t say for sure. One option would be to make everything except for the biscuits and then add them when you go to make the dish! I’m so happy you’re enjoying the recipes. Thank you! I made this tonight using the 2-ingredient dough recipe. I made a double batch and measured 1/3 cup for each dumpling. I baked until they were cooked through…maybe 25 minutes or so. It worked well!!! It was very good!!! Thank you Margie! Any chance you could tell me how much flour you used and what the points looked like afterwards??? You answered my question before I even asked it 🙂 thanks! Do you think this could be made with two ingredient dough??? Amber, I was thinking the exact same thing!!! I don’t know why you couldn’t use the 2-ingredient dough. Has anyone else tried it with the 2-ingredient dough? This may be a dumb question Star. But I made this tonight. It is DELICIOUS. JUST DELICIOUS. My question is should it be pretty liquidy when it comes out of oven and you cut it? Ours was still very liquid’y and I don’t know if I should bake it longer or let it sit out on the counter longer or if that’s how it’s supposed to be? Only reason it matters is it was really hard to cut and being a WW gal I was trying to do 6 equal portions. Thanks again for another amazing recipe. Hubby is obsessed! I was having the same issue. I just ‘cut’ into the cheese so I could see 6 servings. I scooped out as best as I could each serving. Finished scooping out the portions into containers for meals this week. I cooked the biscuits on a sheet pan because I knew we wouldn’t be able to eat it all in one sitting. I have them in a separate container. Made this tonight and it was AMAZING!!! So incredibly yummy! Thanks for sharing! Maybe try the weight watchers 2 ingredient dough!!! Hey! I’m just wondering if there’s a sub for the canned gravy- something maybe a little more homemade? Thanks! Hey! So i’m excited to try this recipe, but I noticed as I was printing it, that it says prep time 10 hr and cook time 25 hr. should this be minutes? Just wondering! Love ya! Hahaha omg! Yes minutes! I’ll change that right away in the morning! I will NEVER make anything that takes that long trust me! Thanks for the heads up girl!